Peachy! | Food It Yourself! And just like that, it is too hot in Central Massachusetts. I have packed away my heavy sweaters. Mr. Food It Yourself has the air conditioner in the bedroom window. Above all else, I want ice cream. Homemade frozen desserts might seem intimidating at first. However, the basic components of sorbet, sherbet, and ice cream are very simple. Sorbet is really a just a frozen fruit purée. Sherbet is fruit purée with milk added. Milk, cream, and sugar can make the simplest ice cream. Take a spin on the internet and you’ll find plenty of friendly, unintimidating recipes for these frozen treats. After a serious search I settled on an ultra-simple Two Ingredient Peach Sherbet. 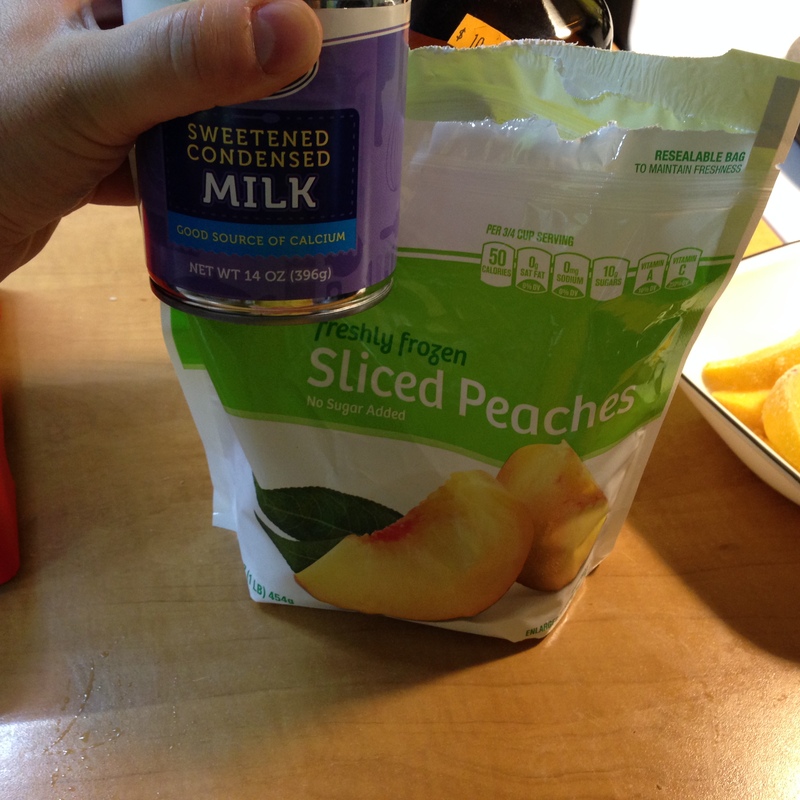 Nothing but frozen peaches and sweetened condensed milk in this tasty dish. And, if you read the whole recipe, you’ll note there are alternate freezing instructions if you lack an appliance to freeze the mix. Yes, store brand stuff is totally o.k. for this recipe. Since frozen fruit is packaged when the fruit is in its prime you may actually get better peaches in the frozen foods aisle than in the produce section. Something to think about in February when you get a peach craving. Essentially, evaporated milk is regular milk with some water evaporated out ( by heat or vacuum pressure) and preserved in a can. It is my favorite milk product for béchamel and cheese sauces as the heat of the canning process stabilizes the milk proteins preventing the sauce from getting gritty. Sweetened condensed milk is evaporated milk that has a good deal of sugar added before evaporation and canning. It has a thick, syrup like texture and is called for in many dessert recipes. Always double check the recipe and the can before you start cooking. I cannot stress enough- these products are not interchangeable. I added the milk to my blender along with one cup of peach schnapps. 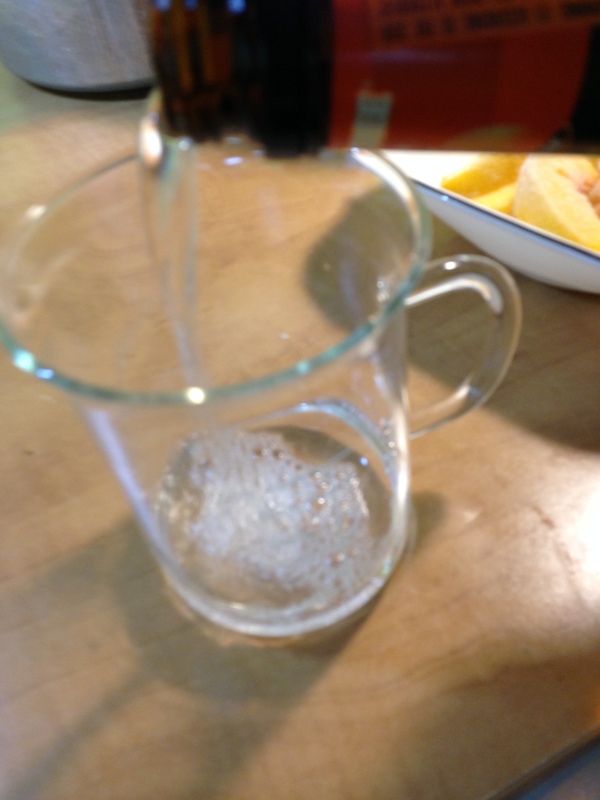 Although the recipe did not call for the added adult beverage the ethanol will prevent large ice crystals from forming in the mix, therefore ensuring easy scoopability later on (half a cup of vodka or rum would work, too.) If you choose not to add the alcohol to the mix you might need to let your sherbet sit at room temperature for a few minutes or at current Massachusetts temperatures for a nanosecond or three before scooping. It all went for a good spin, resulting in a perfectly smooth mixture. 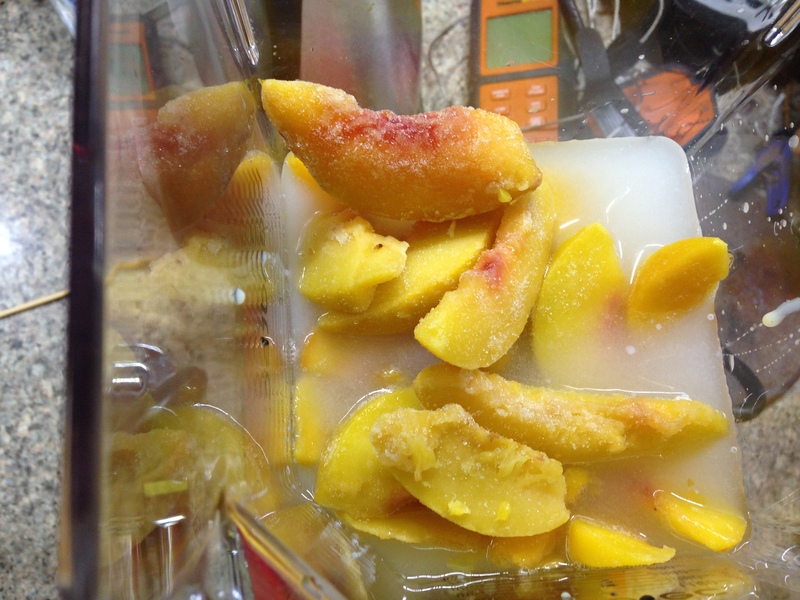 I put some peach slices aside and added them after the main mix was blended, pulsing the blender to leave some peach chunks. This, too, is not necessary, but Mr. Food It Yourself expressed a preference for some texture in the sherbet. After blending, I set the mix in the fridge so “the flavors could marry”, which is the fancy food way of saying that dispersion will equalize the sweet, peachy and milky flavors in all parts of the mix. After a little rest it was on to the freezing appliance. Every machine is a little different, so make sure you know how to use the one you have. Here’s mine, near the end of it’s spin. After the freeze cycle was completed, the sherbet was sealed in a container and stored in the freezer awaiting dessert time the next day. I shared this simple frozen concoction at a family cook out, and it was universally appreciated. I definitely need to try it again with fresh peaches later in the summer. I think the ratio of one pound fruit to 14 fluid ounces of sweetened condensed milk could apply to nearly any seasonal fruit, and the extra flavor options are nearly endless. Flavored vodka or spiced rum could be added. Peaches meld very well with pepper sauce, if you can believe that. Pears and cinnamon might be fun to try. The list goes on. Don’t be intimidated by DIY frozen desserts. They can be easy to prepare and don’t really require a special freezing machine. (I really like having the freezer, though.) Give it a try! You might just decide that frozen treats are just the indulgence your DIYet was lacking in this heat.